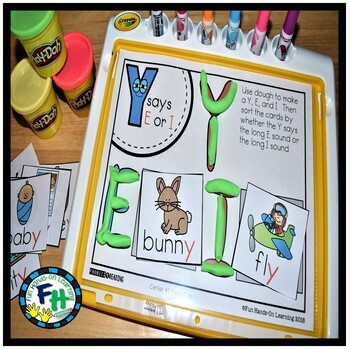 Get ready for phonics fun with this phonics Y as a vowel activity center! Students will use this center for skill mastery through hands-on practice. Blend and segment sounds in single and double-syllable words. Know and apply phonics and word analysis in decoding words. Know the spelling-sound correspondences for common words with Y as a vowel. Decode regularly spelled words with Y as a vowel. •Place the Y says E or I mat in front of you. 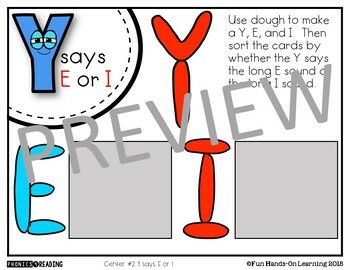 •Use dough to make a Y, E, and I. •Sort the cards on to the mat next to E or I. 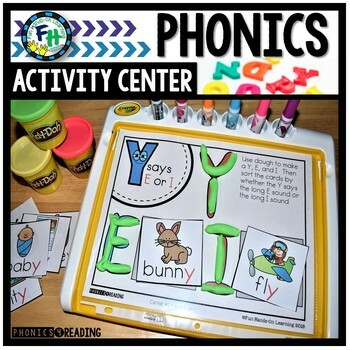 **IMPORTANT** THIS RESOURCE IS PART OF THE PHONICS4Reading PROGRAM HERE.